Earth meets elegance. Made from over 128 recycled beverage bottles. 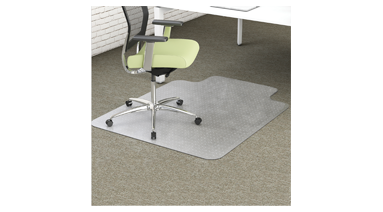 Non-studded design protects hard floor surfaces from caster wear, spills and heavy traffic. Easy-glide rolling surface provides effortless chair movement. For Low Pile, Carpeted Floors; studded. Limited lifetime warranty. Contains 100% post-consumer recycled material. 45" x 53" with lip. Straight edge. Greenguard Gold Certified.